The last 10 years have seen the emergence of the quality, affordable helmet: new models from brands like HJC, KBC, Icon and Scorpion show that unlike the bad old days, you don’t necessarily have to sacrifice protection or comfort to save money buying a lid. But it wasn’t always that way. Ten years ago, if you wanted a good helmet, you bought a Shoei (if your melon was watermelon-shaped) or an Arai (if it resembled a cantaloupe). That raises the bar for the premium brands like Arai and Shoei: these helmets need to have superior fit, function and comfort to justify retail prices sometimes hundreds of dollars more than their competitors. And where the lower-priced manufacturers come out with many new models every year, Shoei and Arai introduce new models infrequently, like wealthy couples obsessing over their precious infants. 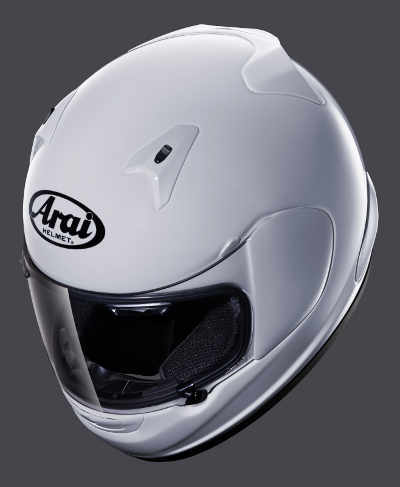 Meet moppet number one: the all-new Arai RX-Q. It bears some resemblance to its older brother, the top-of-the-line racing Corsair V that was introduced in 2008 (and loved by MD contributor Willy Ivins) at the Indianapolis MotoGP. The RX-Q’s design emphasizes “stability, quiet and comfort,” offering a wider faceport (like on the Corsair V), new cheekpads (with the Emergency Cheekpad Removal System that allows EMTs to easily remove the helmet from an injured rider), special noise-reducing foam, vent, and flange design, and a smaller, more aerodynamic shell shape. The shell, like the Corsair, has a distinctive flared flange on the bottom that makes the shell stronger and quieter. The interior shape is an “intermediate oval” that Arai claims will fit a wider variety of rider, not just those drawn by Charles M. Schulz. Arai wants you to know that the RX-Q doesn’t replace the Quantum-2, although the Q-2 will be phased out; it’s a whole new model. The helmet should be at your Arai dealer by January; MSRP ranges from $539 to $679 depending on colors and graphics options. Our second over-privileged child is the new Shoei RF-1100. I’ve eagerly awaited a replacement for my RF-1000, an outstanding lid introduced in 2003. I found it to be one of the more comfortable and quiet helmets I’ve worn. Since I have a smaller-than-average head, I appreciate the range of shell sizes Shoei uses — rather than using one shell for all sizes, Shoei uses a range of sizes to keep their helmets light and good-fitting. The new RF-1100 has five shell sizes for the eight helmet sizes (XXS to XXL), and all the new shells use new technology to enable the rear spoiler (formerly made of stuck-on plastic) to be part of the shell itself, making it lighter and more aerodynamic. The new shell also meets the new Snell 2010 standard. (Is it a better standard than Snell 2005? I’m not opening that can of worms, but I can say it should result in a lighter helmet that won’t be less safe). Other features include a new self-adjusting baseplate for the face shield, which should result in a tighter seal and less noise. That shield is also wider and taller than the old one and is ready for the excellent Pinlock anti-fog insert. The liner is removable and washable, and there are six different cheekpad thicknesses so you can get a perfect fit. The vents are also redesigned for better…um…venting: they’re more aerodynamic, and even offer two open positions so the rider can customize the airflow. We’ve heard that old “optimized airflow” routine before: maybe these will offer a noticeable breeze under 120 mph. We’ll keep you updated. 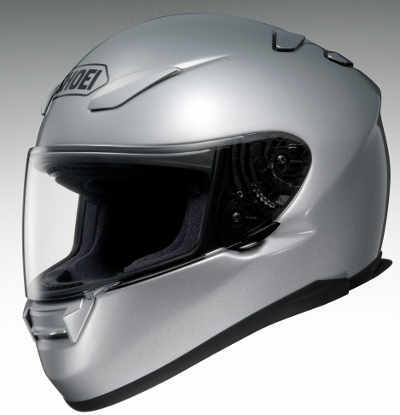 The Shoei RF-1100 is in dealers now, priced between $400 and $500, with a full selection of colors and graphics. I’m eagerly awaiting my first ride in these helmets: time to add some luxury back into my life, recession be dammed.